“The Jim Larkin of India.” | Come Here To Me! The fourth President of India Varahagiri Venkata Giri was a member of Sinn Féin and an Irish Volunteer in 1916 whilst studying law at U.C.D. and was expelled for his activity. 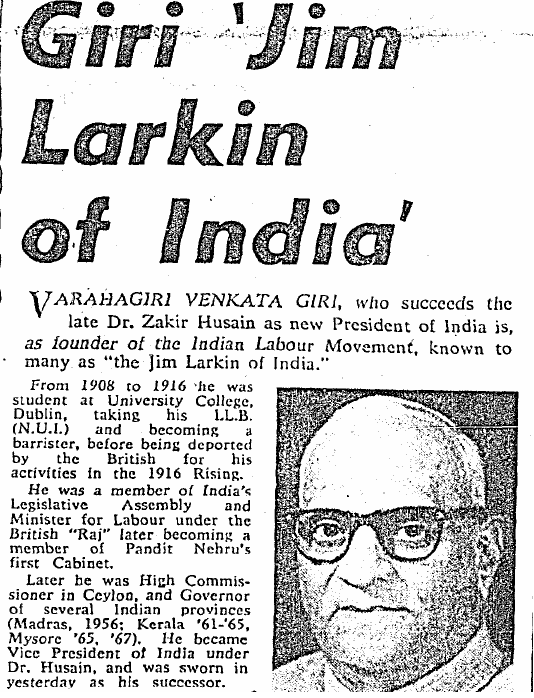 ‘Jim Larkin of India’ – a 1969 edition of the Irish Independent. Giri’s name appeared in the Freeman’s Journal in June 1916, in the aftermath of the insurrection, where it was noted that he was called to a bar, described as the “oldest son of Varahagiri Venkata Jagiah, of Berhampore, Madras Presidency, India.” He was one of several Indians reported to have been called to the bar in that edition of the newspaper. To Giri, it would have meant little – he had already received an order from the authorities to leave the UK by July 1st! In Dublin, Giri was active within the Dublin India Society, which drew support from the dozens of Indian students in the Irish capital. In the aftermath of the struggle of Indians in South Africa for equal rights in 1914, his society in Dublin prepared a pamphlet entitled The South African Horrors, which was well received. 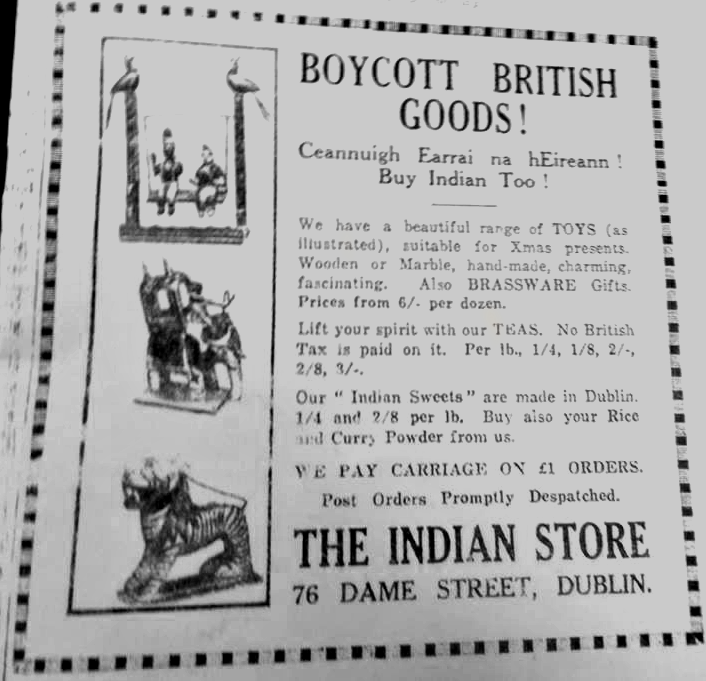 The cause of the Indian people received sympathetic coverage in Irish nationalist newspapers, including Arthur Griffith’s Sinn Féin, as well as The Irish Volunteer. The first was a very big and prosperous gentleman, (Mr. A.) who told me he belonged to the constitutional wing of the Indian Nationalists. He owned a lot of chain stores in India. He assured me he was willing to fall in with any plan the second Indian, whose was Bomanji, and I agreed to. He did not know what Mr. Bomanji had in mind and he did not want to know. – The less he knew the better. He then withdrew and Mr. Bomanji came in. He was a small, quick, intelligent gentleman and he told me at once that he belonged to the militant group in India. His plan was twofold. Firstly, the Indian Moslem League and the All Indian Congress Party were, for the first time – holding their annual conventions in the same town and on the same date. It had been agreed between the leaders that at a pre-arranged signal, a motion could be put forward simultaneously, in both conventions that the rival sects would join hands for the purpose of ending the British occupation. They were then to meet jointly and set up a Provisional Government for India and, thereafter, carry on on Sinn Fein lines. Our part was to send one or two advisers who would, behind the scenes, guide the movement. It was necessary that these advisers should get to India as soon as possible before the day set for the Conventions. The other plan of Bomanji’s was to prepare for a guerilla war against the British. For this purpose, he needed a number of Irish guerilla leaders, twenty or thirty to start off with. They would ostensibly be employed in the chain stores owned by Mr. A. but their real work would be to train companies of selected men in the science of guerilla warfare.